WASHINGTON -- President Donald Trump found a strong political issue in a brutal and needless crime on Thursday when he tweeted about the murder of a central California police officer at the hands of a man believed to be an illegal immigrant. 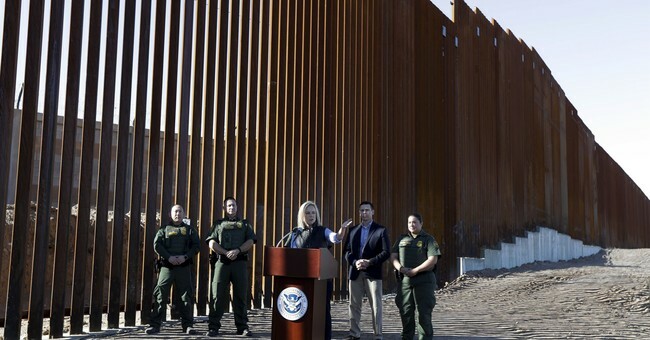 This awful crime is likely to upend the debate surrounding a government shutdown that began because Trump rejected a compromise budget -- which the White House had signaled he would sign -- that did not include some $5 billion for border wall funding. For their part, Democrats don't want to give him that victory. On Friday, Stanislaus County Sheriff Adam Christianson announced that authorities had arrested a suspect, Gustavo Perez Arriaga, an undocumented immigrant from Mexico, in connection with the shooting death of Newman police Cpl. Ronil Singh. Singh had pulled over Arriaga for suspected drunk driving Thursday at 1 a.m. The suspect, he said, had two prior convictions for drunk driving, a "known gang affiliation" and was trying to flee to Mexico. "We can't ignore the fact that this could have been preventable," the sheriff said. Christianson faulted California's sanctuary state law that prohibits local enforcement from communicating with U.S. Immigration and Customs Enforcement unless authorities are holding an undocumented immigrant convicted of certain felonies within 15 years. "Ladies and gentlemen" he warned, "this is not how you protect the community." Singh was the personification of the American dream -- a legal immigrant from Fiji who "came to America to become a police officer," a grief-stricken Police Chief Randy Richardson told reporters. The 33-year-old Singh leaves behind a wife and a beautiful five-month old baby boy. "He had a fascination for making himself better," said Richardson. It is impossible to learn of Singh's death and not think of Kate Steinle, the San Francisco woman who was fatally shot in July 2015 as she walked along the city's waterfront with her father and a family friend. The man who shot her, Jose Ines Garcia Zarate, was an undocumented immigrant with a long criminal record that included seven U.S. felony convictions and five deportations to Mexico -- and he was on the streets courtesy of San Francisco's sanctuary city law. After Garcia Zarate was released from a federal prison in 2015, authorities transferred the multiple felon to San Francisco based on a warrant for a 20-year-old marijuana charge. The district attorney's office then dropped the moldy charge. Rather than comply with an ICE detainer request, the sheriff's office freed the career criminal in keeping with the sanctuary city policy. Steinle's death was completely preventable. "She was murdered because of a failure of immigration policy," said Mark Krikorian of the pro-enforcement Center for Immigration Studies. San Francisco's 2013 sanctuary ordinance protected undocumented immigrants in custody unless they had been convicted of a violent felony in the past seven years. Supporters of sanctuary laws essentially believe that noncitizens not only have the right to break U.S. immigration laws, but also the right not to be deported if they are convicted of many felonies and misdemeanors. No wonder Trump accuses them of supporting open borders. As a Republican candidate for president in 2015, Trump quickly seized on Steinle's preventable death as "yet another example of why we must secure our border immediately. This is an absolutely disgraceful situation and I am the only one who can fix it Nobody else has the guts to even talk about it. That won't happen if I become president." Singh's death shows how a legal immigrant who did everything right can be the one who pays for bad laws. Shortly before Christmas, Tulare County Sheriff Mike Boudreaux blamed California's sanctuary state law from preventing his officers from honoring a detainer request by ICE for Gustavo Garcia, who had been arrested for erratic behavior and testing positive for a controlled substance. Rather than hand Garcia over to ICE, Tulare released him. Within minutes Garcia began shooting people. He killed two and injured others. "That tool has been removed from our hands," Boudreaux told reporters, "and because of that, our county was shot up by a violent criminal." Washington should do something about this.